Michael here, I hope this message reaches you all well rested and satisfied now that the busyness of the holidays are over. As I look ahead to 2018, I can’t help but reflect on what a great year we’ve had. The first milestone of 2017 that comes to mind for me is all thanks to our member of the year and vice president, Terry Molloy. This year, thanks to Terry’s diligent work, we became a recognized 501(c)(3) organization which opens many doors for us for growth and events. Terry’s work as VP over the past year has been hugely helpful and I am very proud to volunteer alongside him again in 2018. Then more recently, the holiday party, and what a festive and fun party it was. Chef Ian, who chopped his index finger pretty good just days before the event, directed a gang of volunteers and put together a fantastic feast (picture him waving around that bandaged finger.) Neil’s generously donated property was mobbed with members & friends and tap after tap of delicious homebrew. Rare bottles were abundant and smiles were ear-to-ear. 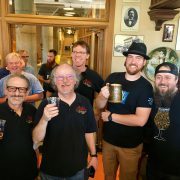 2017’s Southern California Homebrew Festival, our Monster Brew with Smog City, the 3rd annual Los Angeles Belgian Brew Challenge, the summer party at Dean’s, and our hosting of Pacific Brewer’s Cup this year are others that shine brightly for me. All of the above were made possible by volunteers (like our Competition Coordinator Carl), and I’m very proud of and thankful for each. Rob Ruben’s Distilling & Brewing in El Segundo has invited us to a homebrew share on Saturday January 6th at 1pm. We can bring bottles or kegs of homebrew to share and there is room for 40 of us. 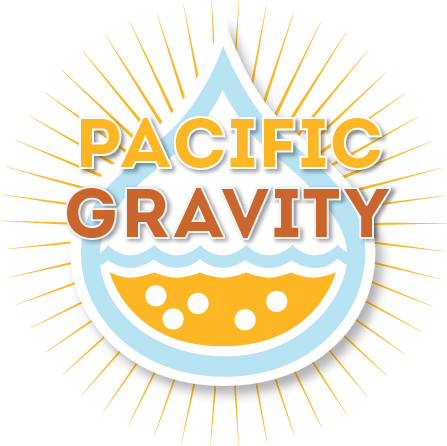 Please drop us a line at board @ pacificgravity.com if you’re interested in joining, to reserve your spot(s). Friends and family are welcome. 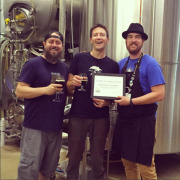 There is currently a Pacific Brewer’s Cup Best of Show Pro-Am beer on tap at Yorkshire Square and the runner-up BOS will soon be available at LA Ale Works. Make sure to tell them you’re with Pacific Gravity! Finally, a quick reminder that the 2018 Southern California Homebrew Festival is approaching fast! Ask a fellow member who has been if you’re not familiar, it is an awesome time and I highly recommend you put it on your to-do for May. We’ll begin collecting reservations in January but if you want to reserve early, reach out and we’ll get you on the list. Again, thank you all for helping to make 2017 such an exceptional year. I’m honored to be President again in 2018 and pledge to (with help from our board and all you volunteers) make 2018 just as memorable and exciting as 2017. See you on the 6th at Rob Ruben’s, if not sooner! http://pacificgravity.com/wp-content/uploads/2015/01/pg_logo.png 0 0 Michael Musgrave http://pacificgravity.com/wp-content/uploads/2015/01/pg_logo.png Michael Musgrave2017-12-26 19:15:212017-12-26 19:13:44End of a GREAT year! I hope this reminder reaches you all well and enjoying your end-of-summer. Thursday is our September club meeting at Culver City Home Brewing Supply and it should be a very fun one, so I hope you’ll come out. We get started at 7:30p and finish up around 10:30p usually. September’s host Keith is bringing out a flight of IPA’s for the commercial tasting and we’ll have some hot food on hand as well. Bring out your IPA styled home brew for the Best of Meeting competition. It’s a great way to get feedback on your beer and winner takes a nice prize. In other news, the board and I are looking ahead to the chili cook-off on November 11th, and we’re thinking elections too as they are usually held around that time of year. If you are interested in running for an elected position (President, Vice President, Treasurer) or might like to be club Secretary or any of our other volunteer positions please reach out. Having been on the board for almost two years now, I can confirm it’s a satisfying way to spend some free time. There is a work aspect to it, but that’s really about perspective. 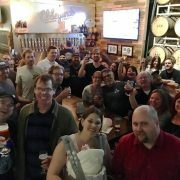 If you already attend most events, and have enough time to put in one more evening per month to help plan (and talk beers,) it’s worth considering and we’d love to have you on board. I’ll end with a link to our events calendar for you. Take a peek at the next few months and plan ahead. I realize there are hundreds of things to do in this city but I’m hopeful you’ll keep us on your radar! Michael here, I hope this message reaches you well and I hope your spring brew sessions are paying off big! 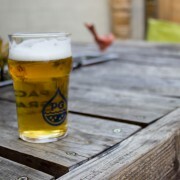 We have definitely had plenty of beer drinking weather, and finally the good sun has landed on the weekends for once. I put a Belgian Saison in the fermenter (at 75F) just this past Saturday and I’m already planning my next warm fermented beer. 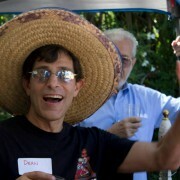 In just a few days now, we’re meeting at Dean’s place for our annual Summer party. There will be plenty of food and home brewed beer, lots of fun people, and we’ll have our door prize raffle as always. I want to make sure everyone who can make it comes out and if you’ve never been to a PG event before, it’s a great one to start with. Members enter free and non-members pay just TEN BUCKS each for free reign on food and access to a wide range of unique and delicious home brewed beer, cider, and mead. Pick your preference of Uber, Lyft, or carpool. Dean’s house really isn’t difficult or far to get to and from the Culver City area and I don’t remember much traffic in previous years. As usual, we need help from members to make this event a success. First, if you’re bringing a beverage to put on tap with us, be it a keg of beer or soda; Reply back to this email and let us know what you’re bringing. Carl will make a tag for the tap handle and everyone will know who made it and what it is. Next up, we need help most on Friday night starting around 6pm and Sunday morning starting around 10am for setup and clean up. It’s a fun way to give back and usually involves a beer or two and some creative thinking. Please, please, please, if you volunteer just one hour – Make it at either Friday’s setup or Sunday’s cleanup. We need the help. Chef Ian may tap you on the shoulder for help too, there will be plenty to do around the BBQ. We need some items too, if you can bring an item or two from this list we would be much better off. Finally, here’s a quick list of things I recommend bringing for you and your guests. See you Saturday at two pm! http://pacificgravity.com/wp-content/uploads/2015/06/dean-sombrero.jpg 745 960 Michael Musgrave http://pacificgravity.com/wp-content/uploads/2015/01/pg_logo.png Michael Musgrave2017-07-25 18:13:152017-07-26 09:08:46Countdown to Party! This Friday is April’s First Friday at El Segundo Brewing Company, a night that was very popular with the hop-heads last year. I overheard some chatter in our Facebook group too, about stopping into Richmond Bar & Grill for food beforehand, which I highly recommend. Tania and I will arrive at the brewery at 7pm. Show up when you can, we will likely be around all night. Don’t forget to bring a growler! ESBC pours are worth taking home. April’s Third Thursday club meeting is on Thursday April 20th at LA Ale Works. We’ll start the night with the award ceremony to close out our 3rd LA Belgian Beer Challenge, and we’ll have a bunch of leftover (cold-stored) entries to taste afterward. Member Barry will be manning the tasting table too! We will also be collecting donations at this event, that will go on to people in need via our connection (Dianne & Mimi) at The People Concern, based out of Santa Monica (formerly Ocean Park Community Center). We’re looking for clean clothing for men, women, and children, unopened personal & household items, gift certificates to supermarkets, fast food restaurants, or retail stores, and books & art supplies. Anything you can bring will be accepted and appreciated. Style of the month is Belgian (a personal favorite of mine) and I can’t wait to try all of the entries into our Best of Meeting competition. Further on down the line, it’s our turn to host Pacific Brewer’s Cup homebrew competition. The details are just coming together now, but we’ll need a LOT of help. Reach out to Competitions at pacificgravity.com if you are interested and able to volunteer some time to help. If you made it this far: Thanks for reading! Hopefully we’ll get to chat some of this stuff up on Friday together, over a hoppy pint of beer from ESBC. See you there. Saturday’s monster brew with Smog City was another seriously fun day. My batches are burping away here near my desk as I type this message, I hope yours are going well. 😀 Shout out to the Smog City team and our PG board for such a well executed event. Coming up this Thursday the 16th we have our March Third Thursday club meeting at LA Ale Works in Hawthorne. Thursday is a perfect time to drop off your entries for LABBC. The window for drop off ends Friday and they’re headed for LA Ale Works eventually either way. Bring them! We’re also still short on coolers for organizing entries too so if you can lend one out until April 1st or so – Please bring it! March is an exciting month for us, so I think it’s best I send around an outline of things to come. I also have some great news to share so read on. Our monster brew with LABBC Gold Level Sponsor Smog City Brewing Company, which is quickly becoming an honored PG tradition, is THIS weekend and I hope you’re ready. 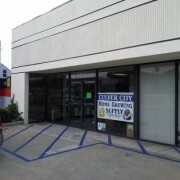 Culver City Home Brewing Supply reports a stash of fresh new fermenter buckets at the ready, if you need one or two. More info, including PayPal purchase link here: http://pacificgravity.com/2017/02/smog-city-monster-brew-march-11th/ I’m looking forward to seeing you all there and I’m hoping for another smooth brew day. Next up, we have our monthly club meeting scheduled next Thursday March 16th at LA Ale Works. They’ve been really hospitable and club friendly so far, and it should be a memorable night. March is dues collection month. Treasurer Tim will be setup to get renewals and new memberships going. To keep our footprint smaller (and cleaner) this is a NO KEGS event. Bring your homebrew, including entries into the best beer of the month competition, in growlers or bottles. We’ll make a space for them, and make sure each one gets a label, and exposure for tasting, etc. Best Beer of the Meeting style is: Irish and Stout beers, in honor of St Patrick’s Day. Submissions for our Los Angeles Belgian Brew Challenge are due, so bring your entries to this meeting. We’re storing and judging the beer at LAAW, so it’s super helpful if you bring them down directly. Also, we could use a few more coolers for the competition. If you have a cooler you can loan until March 26th, bring it too. Barley Hops Grill food truck will be there so bring a few bucks for food. Out of respect for the food truck workers, we’re going to forgo providing outside food and encourage everyone to patronize them instead. Sorry 🙂 No corned beef and cabbage this year. Remember, we’re guests at LAAW. Have an excellent time but keep it respectful and positive. It’s a privilege to be invited in the first place and I absolutely want to be invited back! So we’ve got big plans together this month and beyond! Reach out if you have any questions, especially if you can volunteer to pitch in and help. The team at LA Ale Works cordially invites us to check out their taproom during the soft-launch this Wednesday February 1st from 7pm – 10pm. We are so proud of our friends at LAAW and I can’t wait for Wednesday! Looking further ahead toward the weekend, our friend Drew and the crew at Santa Monica Brew Works invites us into their taproom as well for February’s First Friday. Drew and I had a blast floating FOUR 1/6 bbl kegs of SMBW beer at Surfas this past Thursday night and I’m looking forward to trying the other styles they have, especially the taproom only stuff. First: Remember, we’ve got our 3rd Annual Los Angeles Belgian Brew Challenge coming up quickly and registration and submissions are due sooner than you’d think. Get those Belgian’s brewing and visit belgianbrewchallenge.com for more info. Finally, a brief update regarding the Anchor California Homebrew Club of The Year trip too: President’s weekend created a scheduling conflict for the team at Anchor so they are rescheduling with us on another weekend. As soon as the date is known, I’ll post a sign up with info for those of you who are looking to attend. Looking forward to seeing you all this week! Reach out if you have any questions. Let's go visit Drew and team at SMBW! Just two blocks off the rail, this one should be a fun 1st voyage to one of the newest breweries in town. Let’s go visit Drew and team at SMBW! Just two blocks off the rail, this one should be a fun 1st voyage to one of the newest breweries in town.